The Department of Education, CTA and the representatives from the US Embassy, New Delhi interviewed 19 applicants out of shortlisted 20 on May 12, 2017 in Dharamsala, and selected 6 finalists for the year 2018-19 Tibetan Scholarship Program. One candidate failed to appear for the interview because of personal prior engagement. The program was established in 1988 through US legislation to educate future Tibetan leaders. Since then approximately 435 Tibetans have attended the US Universities under its auspices including many who are currently serving in different departments at top level, including Dr. Lobsang Sangay, President of the CTA. 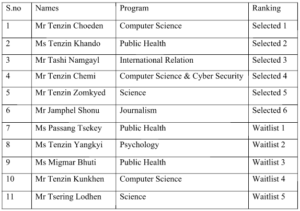 Students from Tibetan refugee communities in India and Nepal are eligible to apply for these two-year graduate fellowships in more than a dozen fields, including business, computer science, cyber security, education, international law, international relations, journalism, psychology, public health and science. Each year seven students are selected contingent upon funding. 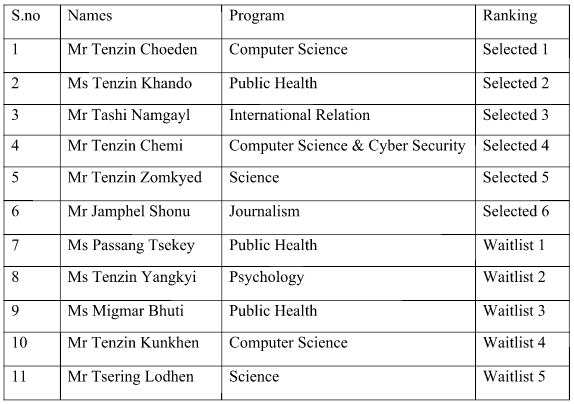 Upon their return, the fellows must serve the Tibetan community for a minimum period of two years. The Department of Education in Dharamsala, and Tibet Fund in New York City carry out the Administration of the program.